The European drugs problem is increasingly linked to, and influenced by, global developments. The importance of identifying trends occurring in EU neighbouring countries and worldwide that could impact on the European drug situation is therefore underlined in the EMCDDA Strategy 2025. Among the agency’s work in the area of international cooperation is support for EU drug-related regional programmes. These include the Central Asian Drug Action Programme (CADAP), which is currently in its sixth phase (1). 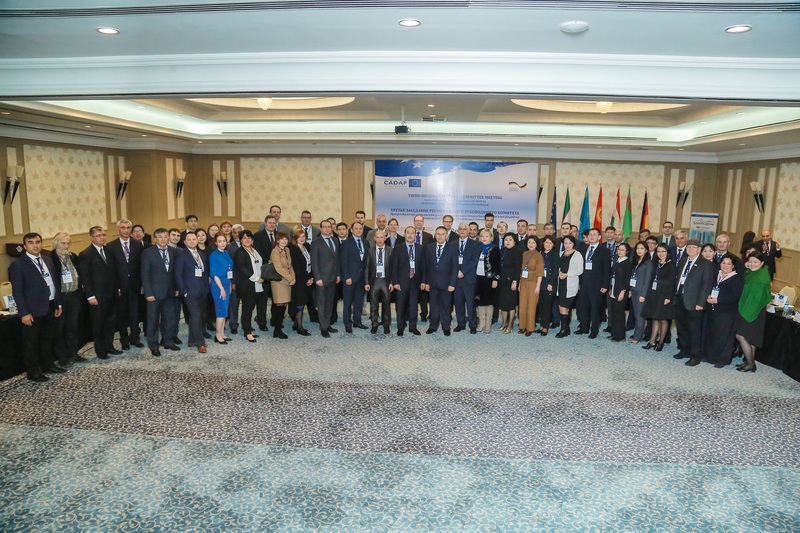 CADAP 6 reflects the EU’s long-term engagement with Central Asian partners to help further strengthen their national policies in drug demand reduction. Five Central Asian countries participate in CADAP: Kazakhstan, Kyrgyzstan, Tajikistan, Turkmenistan and Uzbekistan. The overall objective of the programme is the gradual adoption by the five countries of EU and international good practice on drug policy in order to contribute to the reduction of drug problems. The beneficiaries include: policymakers, drug experts, penitentiary and hospital staff, media professionals, teachers, drug users, prisoners, young people and the general public. This month, the EMCDDA participated as partner in CADAP’s Third regional project steering committee meeting held in Tashkent, Uzbekistan (16 February). Presentations included an overview of CADAP activities in 2017 as well as plans for 2018. Highlights in 2017 included: a report on the state of play of drug policymaking in Central Asia; reports on the national drug situations in the CADAP countries; and a national school survey in Kyrgyzstan. All programme activities under CADAP 6 focus on national and regional capacity building, providing policy advice and technical assistance as well as monitoring of the drug situation, prevention, drug treatment and harm reduction services. With CADAP 6 coming to a close on 31 March 2018, the meeting allowed for negotiations on a potential 18-month extension of project to September 2019. Topics proposed for the next phase included: alternatives to incarceration; universal access to care; new psychoactive substances (NPS) and institutional support for national focal points. During the meeting, the EMCDDA presented its current activities in the area of international cooperation and outlined possible ad hoc activities and support for CADAP in the future. In 2017, the agency opened up its expert meetings to participants from Central Asian countries. It also invited the Heads of national drug monitoring centres in Central Asia to attend its latest annual extended meeting of the Reitox network, bringing new opportunities for networking and discussing drug monitoring challenges. In October 2017, the agency hosted an expert from Kazakhstan for a one-month study visit, focusing on NPS treatment and the related methodological framework. In December 2017, the EMCDDA and the Portuguese Reitox focal point (SICAD) welcomed a delegation of 15 representatives from Central Asia for a week of presentations on the work of the two organisations. The EMCDDA Strategy 2025 and the EMCDDA International Cooperation Framework 2018–25 — adopted by the Management Board in December 2017 — explicitly identify partnerships and synergies with relevant international organisations and cooperation with third countries as one of the agency’s main business drivers to strengthen the EU drug information system. The EMCDDA’s 2018 work programme stipulates that the agency will continue to support the European Commission, as requested, in the implementation of EU drug-related regional programmes, such as CADAP. At the upcoming meeting of the UN Commission on Narcotic Drugs (CND), being held in Vienna from 12–16 March, a CADAP representative will provide input for a side-event on drug policy, chaired by the Government of Kyrgyzstan. (1) CAPAP 6 is funded by the European Union and implemented by a Consortium of institutions: Trimbos Institute (the Netherlands), ResAd (Czech Republic), National Bureau for Drug Prevention (Poland) and Frankfurt University of Applied Sciences (Germany) led by Deutsche Gesellschaft für Internationale Zusammenarbeit (GIZ) GmbH.